Cracking the Billy the Kid Case Hoax is a riveting and rollicking saga about the author’s decade spent saving the iconic Old West history of Billy the Kid and Pat Garrett from an elaborate historic/forensic scam fabricating that Garrett never killed the Kid, but was a murderer of an innocent victim for grave-filler. It took the author’s knowledge as an M.D. 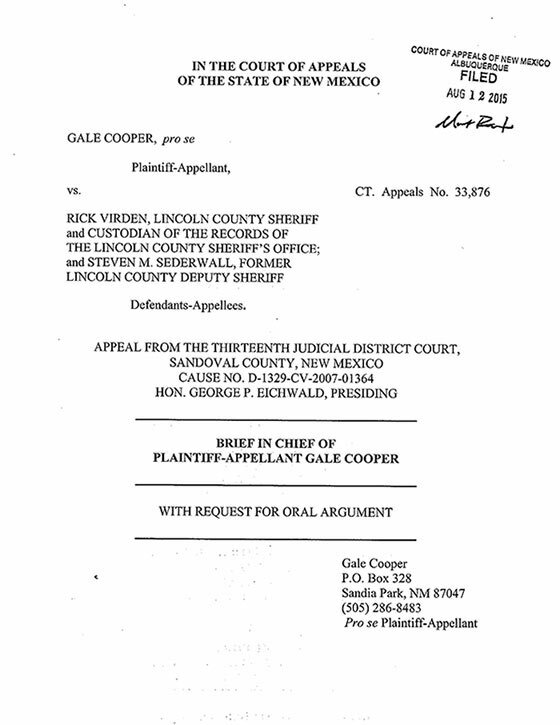 forensic psychiatrist, expertise in Billy the Kid history, and willingness to risk danger as a whistleblower to crack that hoax perpetrated by corrupt Governor Bill Richardson, and colluding lawmen, lawyers, and judges; in uncanny replication of New Mexico’s original Santa Fe Ring, and its head, Thomas Benton Catron, which had also attacked Billy Bonney! New Mexico calls itself the “Land of Enchantment.” This is true if “enchantment” includes the ghostly miasma of wickedness hanging over the populace since the days of Billy the Kid. My shining light on public officials grimly conspiring - like their antique predecessors - to subvert law and hide their crimes may finally break that spell by laughter’s purification. Their motive was ludicrous: hijacking Billy the Kid’s history. They called their fake investigation “the Billy the Kid Case.” I blew the whistle on them. They fought back as if it was 1878’s Lincoln County War. Battling an absurd crime still takes courage. Unfortunately, I am a coward - bad for a whistleblower. Cowards worry about danger. Whistleblowers live it. But I got no threats. Threats mean the crooks think you would back down. They knew I would not. If anything happens to me, it will be in New Mexico’s Old West tradition; just like Billy the Kid got his - ambush. 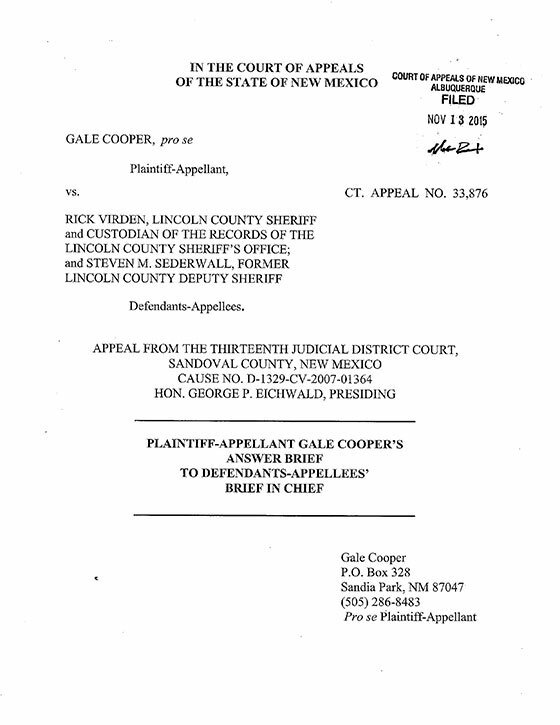 Here is the open records litigation hearing in which author, Gale Cooper, culminates her fight to protect the true history of Billy the Kid and Pat Garrett from the Billy the Kid Case Hoax. 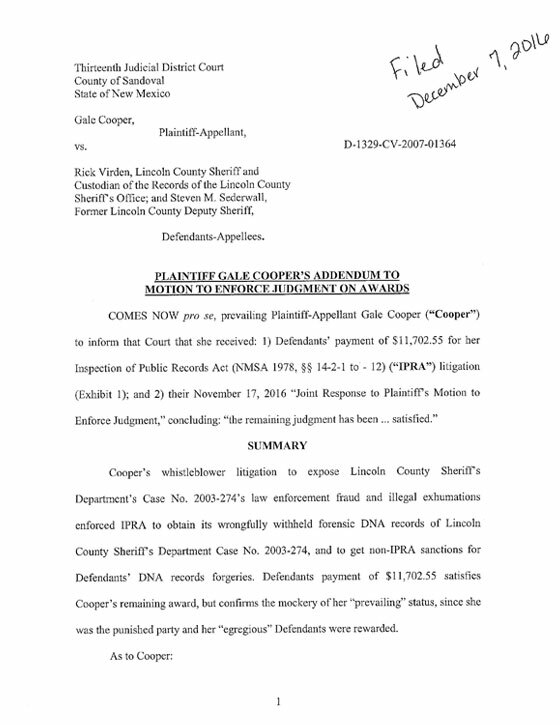 At stake are penalties to be paid by the hoaxers of about a million dollars for their hiding of the DNA records of Lincoln County Sheriff’s Department Case No. 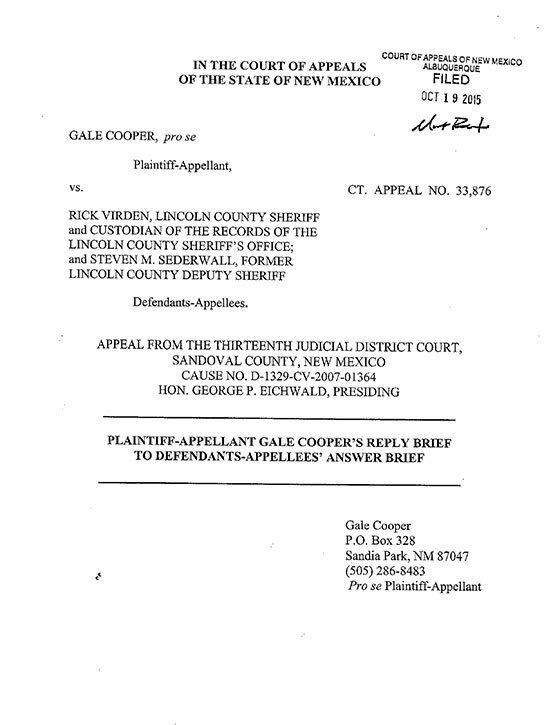 2003-274 (the “Billy the Kid Case”) – records which expose their hoax. Continued is revisionist historian Gale Cooper’s exposé of the modern Santa Fe Ring, whose obsession with hijacking Billy the Kid history replicated the original, 19th century, Santa Fe Ring’s obsession with the Kid himself. At stake now are civil rights. At stake back in Billy the Kid’s day were civil rights too, as fought for and lost by him and his fellow freedom fighters in the 1878 Lincoln County War against the Santa Fe Ring, and its head, Thomas Benton Catron. 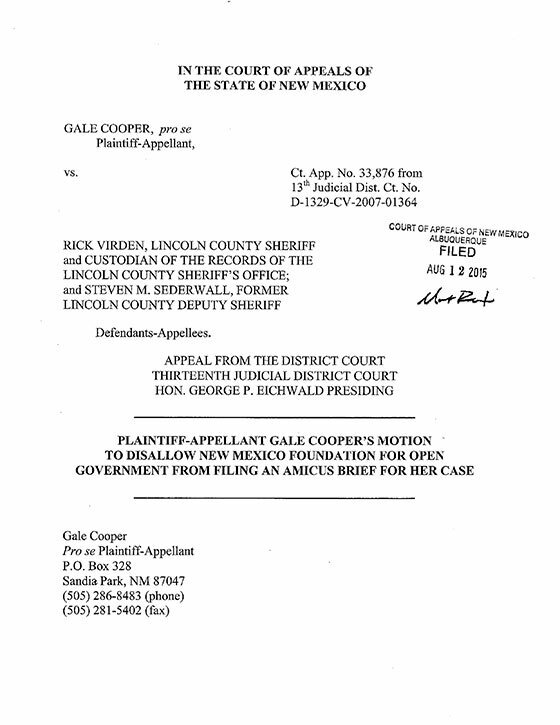 The next step in seeking justice, was a New Mexico Supreme Court appeal of my Court of Appeals denial which declared that my defendants should get no penalty either for seven years of violating open record’s law in District Court, or for forging records to trick District Court that the records into thinking that the records in question were not public. The challenge was that the sitting Supreme Court judges (save one) were the ones who passed another case in 2015 removing penalty for public officials’ violating of the open records act! And the chief justice was appointed by past Governor Richardson; and his attorney wife participated in the Billy the Kid Case hoax with Richardson! Unsurprisingly, it took them only 22 days to deny my appeal without explanation. 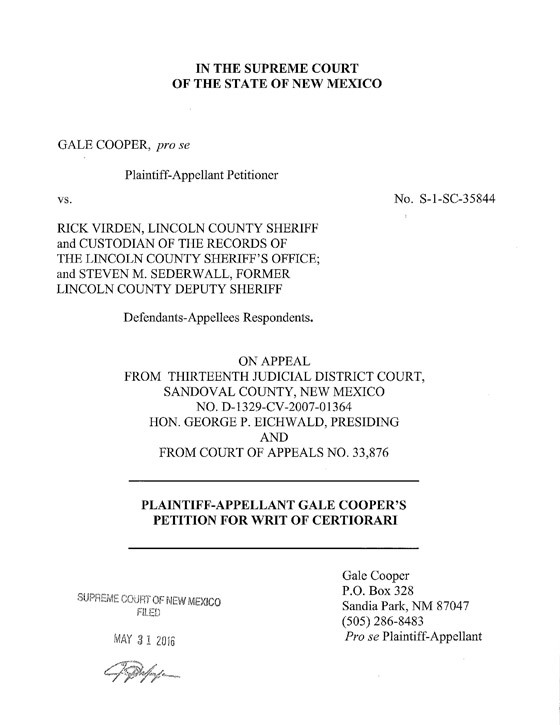 The next step in my seeking justice was my July 5, 2016 appeal to the New Mexico Supreme Court for a reconsideration of their denial of my appeal. 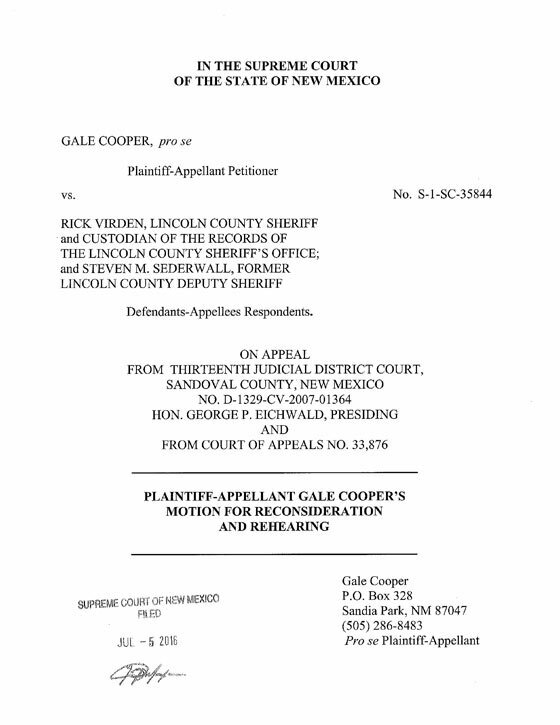 I evoked their judicial code of ethics; and summarized my appeal which had stated that their 2015 decision removing penalty to New Mexico’s Inspection of Public Records Act’s (IPRA) violators was fatally flawed by improper statutory interpretation, fallacious logic, fabrications, judicial usurping of legislative power to write statutes, and by shielding violators and burdening requesters. 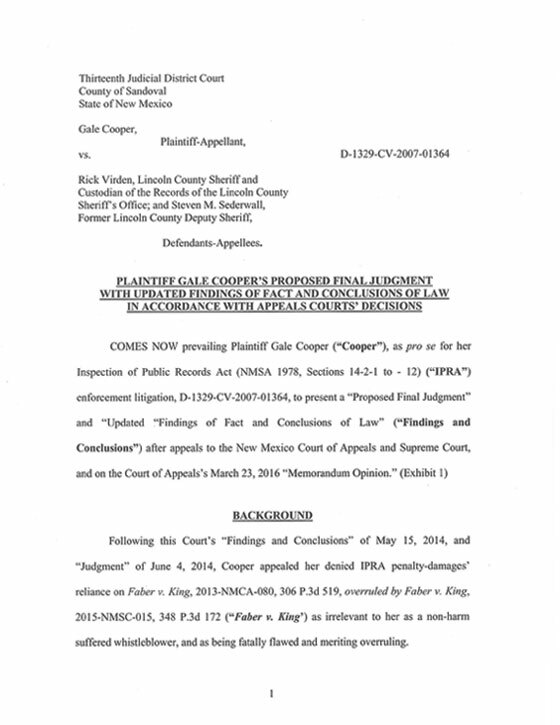 In only 15 days, on July 20, 2016, that Supreme Court denied my appeal for reconsideration without explanation. That means the Supreme Court upheld its own removing of penalty to corrupt officials - including my defendants - for wrongful hiding of public records. That means the Supreme Court upheld the Court of Appeals’ removing the separate penalty for my defendants’ years of forging records to trick my judge that the records were not public. That means the Supreme Court upheld my Court of Appeals’ decision that any letter at all denying public records is acceptable - even fraudulent ones like I received - as long as it is sent in a timely fashion! That means the Supreme Court found nothing wrong with my crooked defendants and their profiteering attorneys getting a half million taxpayer dollars in legal fees for seven years of stonewalling litigation, when the records were available at the time of my request for taxpayer cost of postage! 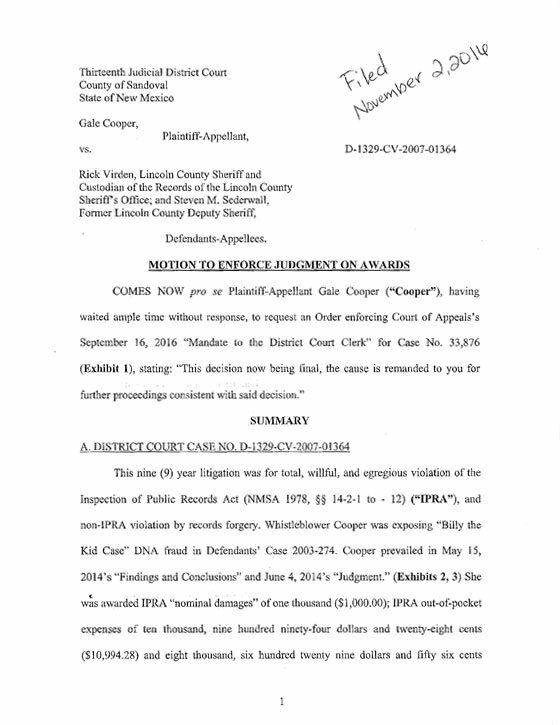 As I wrote in my Supreme Court appeal, they should just rename IPRA: Ignoring of Public Rackets Act. In fact, my case demonstrates what Santa Fe Ring-style corruption of all-pervasive malignant cronyism looks like in action. This is what made possible the Billy the Kid Case hoax. The next step was requesting my District Court judge - to whom the case was now remanded - to order the Defendants to pay me the pathetic awards remaining to me as the prevailing Plaintiff after years of outrageous judicial decimation of them by the Court of Appeals and Supreme Court. 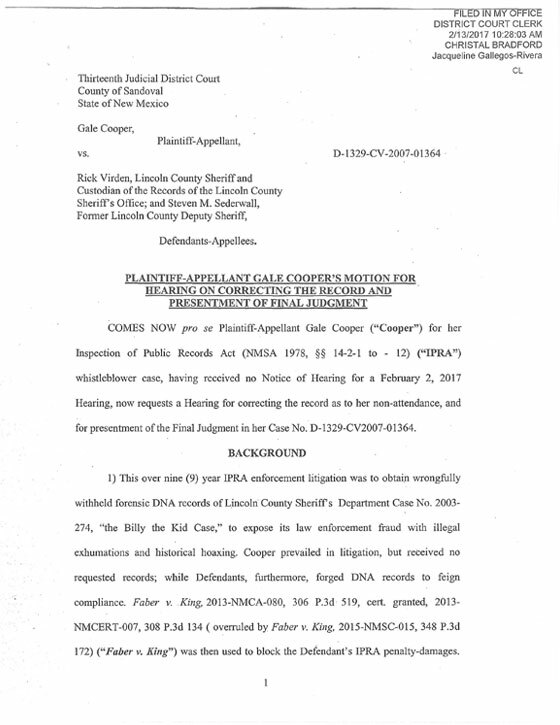 This concluded my legal filings against the Billy the Kid case lawmen fraudsters; also exposing their profiteering attorneys and judicial enablers. 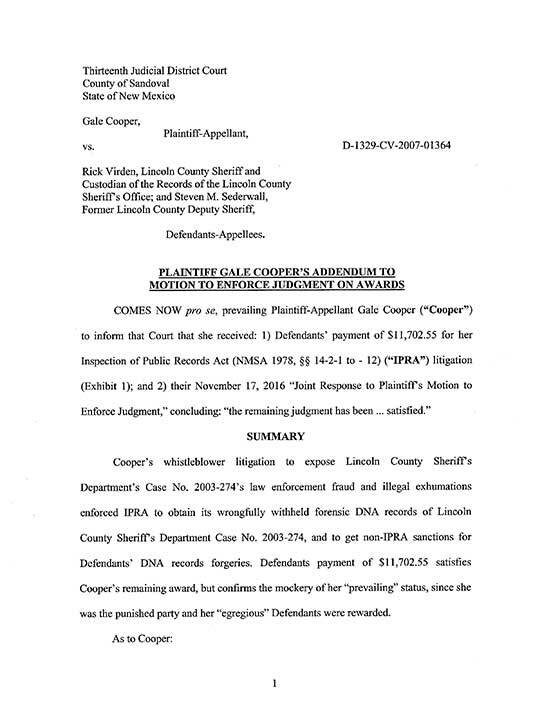 After 9 ½ years of judicial abuse as a whistleblower of New Mexico corruption, I thought I had seen it all. I had not. For my case’s important final hearing, the Court simply never told me it was scheduled. So, of course, I did not attend - and was made to look like a deadbeat. So I filed this motion in objection. 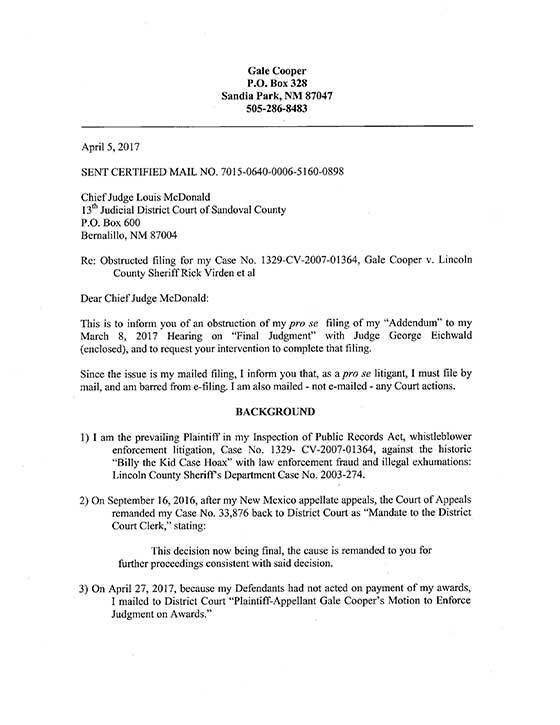 For my March 8, 2017 final hearing on my case to present the Final Judgment, the judge barred me from videotaping, would not allow me to give my closing statement, and refused to accept my Proposed Final Order. 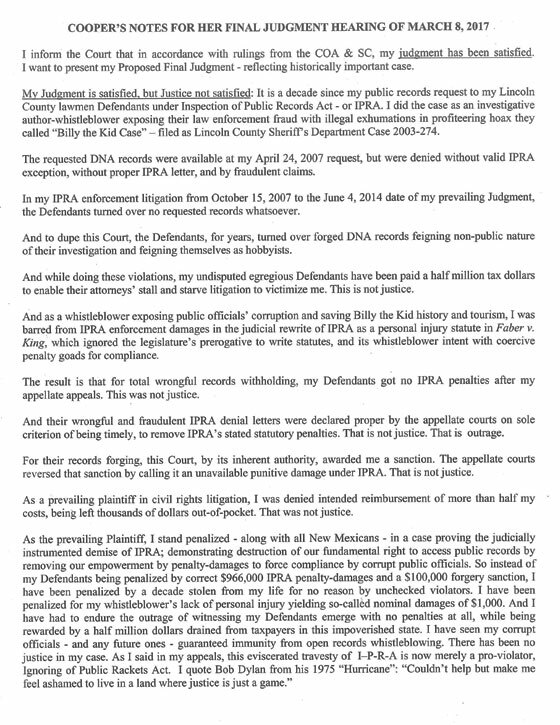 He accepted only my Defendants’ Order saying merely that the judgment was fulfilled and the case is closed. When I persisted about my own Proposed Judgment, the judge admitted it as an Exhibit. After my District Court judge finally scheduled the final hearing (after first not informing me of it and letting the losing defendants write the Final Judgment), he refused to accept my own Final Judgment proposal as the prevailing plaintiff - to let the defendants write it again. When I objected, he said he would take my document as an “Exhibit.” But it was meaninglessly not an “Exhibit” to any document. So after the hearing I submitted to the clerk’s office an explanatory “Addendum.” (See “Addendum” below). The judge then illegally stole my “Addendum” from the clerk’s office before it was filed. I then complained to his chief judge, who merely stonewalled me by never responding to my repeated requests for action. 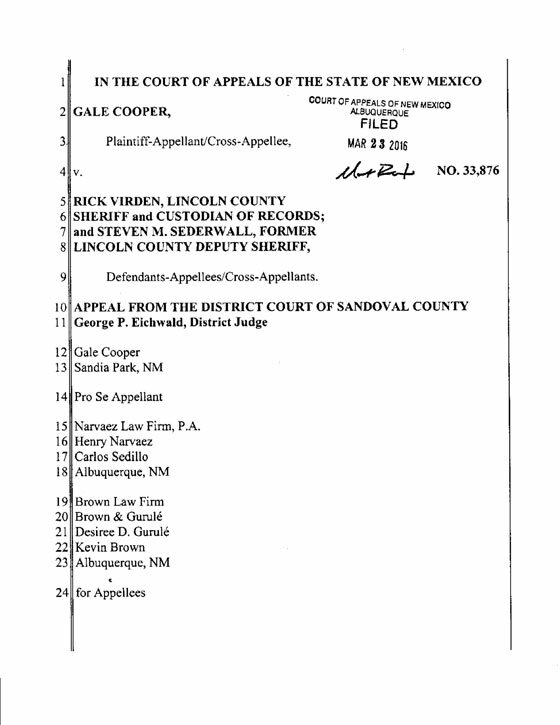 (See “Complaint” below) This is Santa Fe Ring corruption of cronyism and collusion in action. 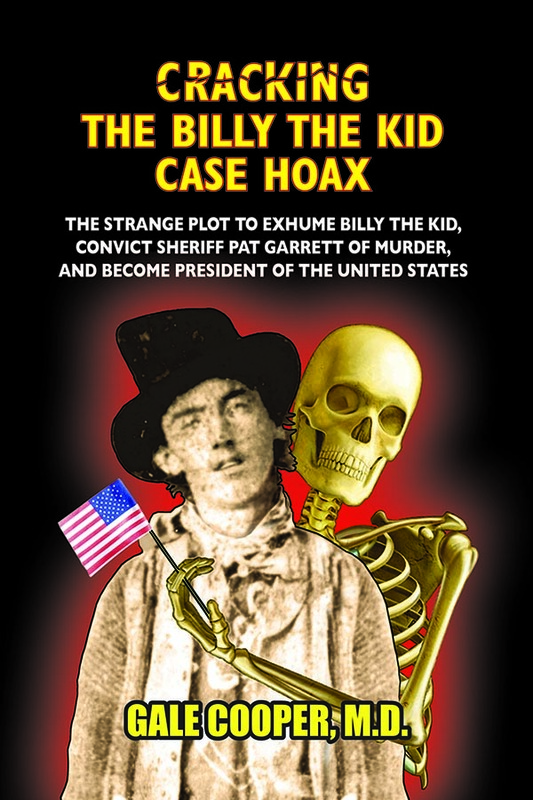 Read CRACKING THE BILLY THE KID CASE HOAX to get the full and unbelievable story.